Posted on April 8, 2015 in Industry by Emily E. Steck. Tumblr’s weird. Let me reiterate that. Tumblr is weird and it knows that it is weird. In its login page, Tumblr’s Staff is even on the joke, admitting that it is “so easy to use that it’s hard to explain” (until it does explain it). Tumblr is a microblogging platform that allows you to share text, photos, quotes, links, chats, audio and video. Like I said, Tumblr is weird—though that weirdness may be threatened recently thanks to recent updates. There are over 225 million blogs and 100 billion posts on Tumblr. It’s a great platform to build, grow and share content because all content comes back to Tumblr. Users spend approximately 28 minutes per session on the site and 50% of them use mobile, according to SEJ. It’s hot with the young’uns and the community rewards that good content put forward. Your favourite memes? Your favourite gifs? Probably started on Tumblr. If you want to make the most out of your content, you’ll probably want to create your own Tumblr and get involved. Don’t know where to start? Here are some of our best practices for Tumblr. Tumblr is weird. It's also a great platform to amplify and discover content. Here are some best practices to use and master the platform for your brand or publisher. What Is Tumblr? Why Should I Use It? A microblogging platform that publishes, reblogs and likes text, visual, audio posts and more, Tumblr is a collector of content with over 100 billion posts. It's a powerful distribution platform. 78% of Tumblr posts are image-based. The key to succeeding on Tumblr is to be able to translate your brand’s stories for the native community. Take your content and Tumblrfy it with a meme or humor. Tumblr is a great place to discover content (though its SEO is bad). Help people discover yours by tagging posts with plenty of keywords. Anticipate what people will search for on Tumblr, not Google. Tumblr traffic climbs after 4pm EST and peaks at around 10pm. The best nights to post to Tumblr are on Sunday, Monday, Tuesday and Thursday. 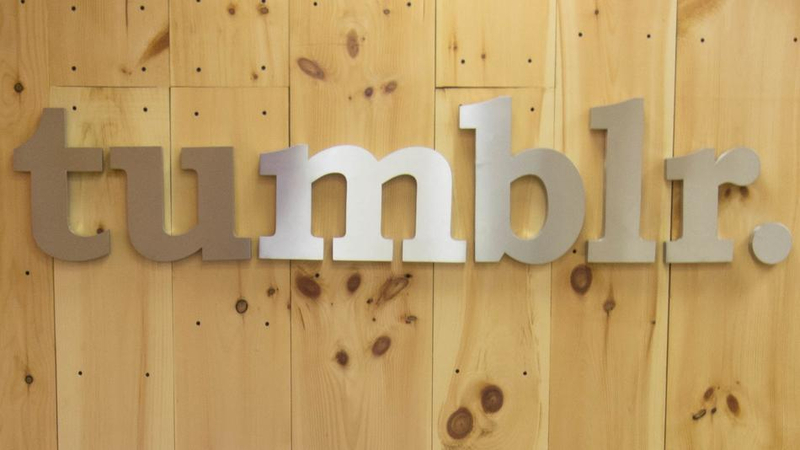 Tumblr skews young with 66% of its users under 35. Always source back to the original content source. Learn Tumblr humor/speak/community rules. Engage with proper reblogging and liking ettiquette. Never spread hate. Open your ask box. In an interview with NPR, the head of Tumblr’s Director of Product for Community and Content says, “Most of the interactivity with your blog (likes, reblogs, etc.) will happen on the Dashboard, but your blog is the best way to get a fully comprehensive look at all of your content, so you want to leave a good impression.” The best way to do this? 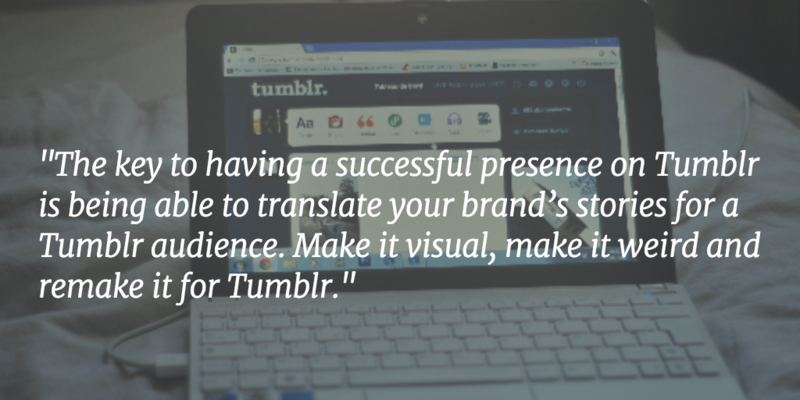 Make sure your look good on your blog, but appeal to Tumblr’s dashboard. Like on other platforms, users are interacting with their dashboard to see posts from the blogs they follow, often reblogging and liking posts. All of the action on Tumblr occurs within the site’s dashboard, where users scroll down to see posts from other Tumblr users they follow (and also native ads and suggested blogs). Tumblr is still a highly visual platform. Photos, gifs and video tend perform better than text, audio and link posts. 78% of Tumblr posts are images. The key to having a successful presence on Tumblr is being able to translate your brand’s stories for a Tumblr audience. This acts as a teaser to go to wherever your content is hosted and for users to check out your content. For example, can you take a quote out of your content and pair it with a picture? Can you make a gif out of our video? Buffer’s Pablo has made it very simple to pair pictures and text for social media posts, or you can just stick to Photoshop to make these images and gifs. Though the Tumblr audience skews young (the average demographic is 18-34 year olds), it loves all kinds of great content, especially when that content has adopted Tumblr practices. If you want to use Tumblr to boost SEO rankings in Google, you’re out of luck. Tumblr is a microblogging platform that doesn’t have the inbuilt tools to power a blog that WordPress and Blogger do. It does, however, have a great “in-house” search engine to discover trends, content, etc. Within posts, Tumblr allows users to tag keywords (the first five tags are the most important, but use as many as you want). Tumblr users may treat the tagging section as an organization for their own blog, a personal diary of sorts (seriously) or a place to optimize keywords for discoverability. Always tag your posts. (Never spam!). Use multiple tags from across categories to help users find you better. For example, if you are blogging about an event, like the Olympics, use a variety of keyword tags: Olympics, Olympics2020, 2020 Olympics, Oly 2020, Tokyo Olympics, etc. Anticipate what people will search for on Tumblr, not Google. The top 10 Tumblr tags are LOL, Fashion, Vintage, Art, GIF, Makeup, Animals, Landscape, Film and Nail Art, according to Search Engine Journal. Not sure what tags to use? Use the Explore page on Tumblr to see an updated list of popular Tags. Tumblr is a party destination for night owls, introverts, insomniacs, the after-work and school crowd and generally really young people. 66% of all visitors are under the age of 35, while 39% are under 25 years old like to use the site. According to Bitly, Tumblr traffic climbs after 4pm EST and peaks at around 10 pm. The best nights to post to Tumblr are on Sunday, Monday, Tuesday and Thursday; Friday nights can also get a lot of traffic. Obviously, these hours aren’t conducive to business hours. Luckily, Tumblr has a handy scheduling feature so you can control when posts publish to Tumblr. You can also “Queue” posts to publish during certain hours on certain days. Experiment with scheduling and the Queue tool to see what times work best for the type of content you are sharing. When it comes to Tumblr, it’s best to #StayWeird. Tumblr has become the go-to place for content discovery from publishers like Buzzfeed, for instance. We can thank/blame Buzzfeed, who found #TheDress viral phenomenon on Tumblr. Respond to comments and comment on others posts. It’s community building 101. Engage with followers and earn their trust, which in turn increases their engagement on posts, links, comments and business. Remember reblog etiquette. Always source back to the original content source. Reblog content you find on Tumblr instead of lifting the content directly from the blog and creating your own post. Have an open ask box. Users like this open communication channel to ask questions, send compliments, etc. It creates transparency if you allow anonymous asks. You can change this in the settings. Make your blog pretty. Though the main action occurs on the dashboard, your blog and URL (username.tumblr.com) should be pretty. Use analytics. Tumblr has a built-in “activity feed,” which gives users basic analytics about their accounts as well as notifications. You can also set up Google Analytics and use Tumblr stats to see how successful your posts are. Learn Tumblr humor/speak/community. This goes back to staying native on the platform. How you craft content should be different for Tumblr just like the content you publish on Twitter is different than what you publish on Facebook. X-Kit Extension. The X-Kit extension is a must-download extension available for Chrome, Firefox and Opera. It makes posting, scheduling and more much easier to use on Tumblr. It’s an incredibly handy tool that Tumblr loves. Stick to the post type. If you are making a text post, avoid inserting quote post, avoiding custom HTML whenever possible. Be patient. Creating a Tumblr blog, presence and community can take time and the results may not be instantaneous. Brandon Stanton’s Humans Of New York blog is actually hosted on Tumblr. Taylor Swift, queen of Tumblr. That’s all folks! Those were our best practices for Tumblr. And as you fall into Tumblr, I leave you with a gif. Follow us on Facebook and Twitter for insights on content marketing, publishing and more.